The chart shows Glencore share price movements since July. 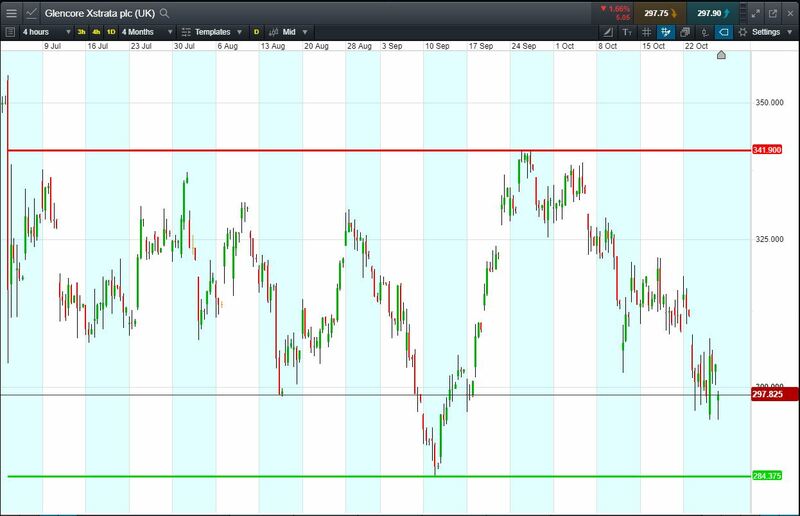 Recent share price range: Sept lows 284p; Sept highs 341p. The current share price is 297p (at time of writing). Glencore reported today that Q3 copper production +12% YoY due to restart of Katanga operations. FY production guidance unchanged, except for oil (natural field declines), but oil makes up a small portion of company’s portfolio. Let’s say you think that Glencore share price is likely to rise as a result of this news. You decide to buy exposure to £10,000 worth of Glencore using a CFD, at the current price of 297p. To do this, you need £2,000. For the purpose of this example, let’s assume the Glencore share price rises by 10% following the news. Your profit would be £1000, from your initial investment of £2,000.